The mountainous region of Central Cordillera in northern Luzon is home to a large number of indigenous communities. Their fierce self-determination and geographic isolation provided relative protection from the cultural influences of Spanish colonisation. However, their art did not remain unchanged. Communities retained forms which were useful and meaningful, abandoned others and created new forms to meet new purposes – a tradition that has continued into 21st century. 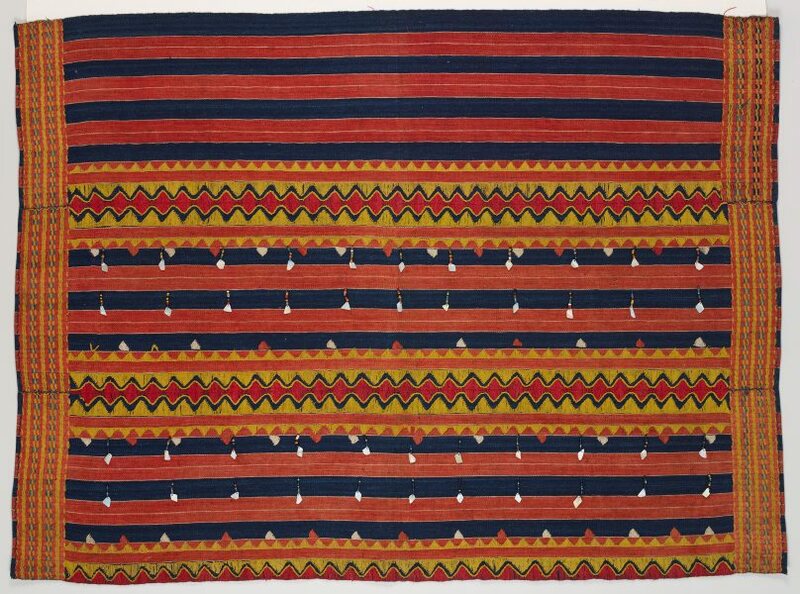 In Central Cordillera art is part of everyday life and is intrinsically linked to community and spiritual wellbeing. Many villages are built around a central stone platform where social and spiritual rites are performed. These include the worship of deities and ancestors and the consecration of sculptural figures. The carving of ancestral and religious figures, while today most prevalent among Ifugao men, was previously a practise shared by all communities of the Central Cordilleran mountain range. Textiles, on the other hand, are woven exclusively by women using backstrap looms. There has been a long and active trade in locally woven products, so many communities share techniques and an appreciation for similar motifs and colour schemes. The basic dress for women across the Cordillera region consists of a skirt which is sometimes complemented with a jacket. 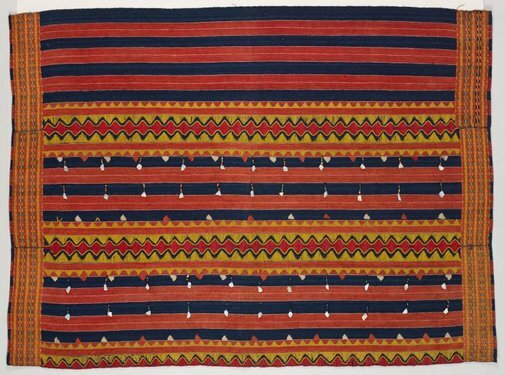 While many motifs and colours are shared across the region, Kalinga clothing is particularly brightly coloured and is often dominated by bands of fiery red. This type of wraparound skirt is generally known as tapis in the Tagalog language and as kain to the Kalinga. It is characterised by horizontal stripes bordered by decorated panels along the joins and edges. In typical fashion, this example is further embellished with embroidery, beads and mother-of-pearl shells. The shells, which were an imported novelty for mountainous communities like the Kalinga, are attached so has to move and reflect light. This adds a dynamic element to the overall design of the skirt. Ross Langlands, TAASA Review , 'Collecting Filipino Textiles: Interview with John Yu', p 22, Sydney, Jun 2017, 22 (colour illus. ).